The Bermuda Tourism Authority will share recently compiled research on the superyacht tourism industry during public information sessions next week. “The Bermuda Tourism Authority is sharing its superyacht business intelligence with local stakeholders because we want to collaborate with our partners to secure the superyacht audience as a legacy benefit of the America’s Cup,” said Bermuda Tourism Authority Chief Executive Kevin Dallas. 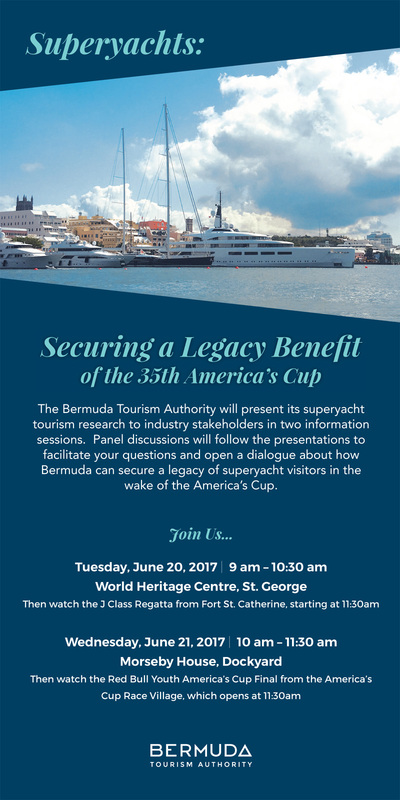 “The information sessions, titled “Superyachts: Securing A Legacy Benefit of the America’s Cup”, will take placeTuesday, June 20th at the World Heritage Centre in St. George [9am-10:30am] and June 21st at Morseby House in Dockyard [10am-11:30am]. “Each of the sessions will include a panel discussion featuring local and international figures versed in the superyacht market including Mark Soares of Bermuda Yacht Services, Laura Esteve of BWA Yachting and Denise Riviere of ACBDA. The sessions are free. An online RSVP is required. Space is limited. “After the presentations, attendees are encouraged to attend J Class Regatta spectating at Fort St. Catherine on Tuesday and the Red Bull Youth America’s Cup finals at the America’s Cup Village on Wednesday. Team BDA will be competing in the Red Bull Youth America’s Cup finals. “The Bermuda Tourism Authority worked with the Superyacht Intelligence Agency to compile its research. Consultants at Superyacht Intelligence manage a database of 5,000 superyachts, reaching 40,000 people associated with the superyacht industry. “In addition to the pre-America’s Cup research conducted by Superyacht Intelligence Agency – which includes case studies, surveys and data analysis – the Bermuda Tourism Authority is conducting its own consumer feedback survey of superyacht captains who are in Bermuda for the America’s Cup. “Many are visiting for the first time and are sharing their impressions on a variety of subjects, including expectations on the cost and quality of the island’s services. “The America’s Cup Event Authority reports 51 superyachts berthed at docks around the island in its heavily subscribed America’s Cup Superyacht Programme. Officials expect another 30 or more superyachts to visit the island during the 35th America’s Cup between May 26th and June 30th. Will they schedule another session for after hours when more people can attend? Good job BTA Team. Keep up the good work.